Trump Nixed the Iran Deal: What Next? L'Informale's English title: "New challenges in the Middle East: Interview with Daniel Pipes." Italian original: "Nuove sfide in Medioriente: Intervista con Daniel Pipes." Question: As a critic of the Joint Comprehensive Plan of Action (JCPOA) with Iran, nuclear agreement, what is your evaluation of Donald Trump's nixing it? Answer: I am extremely pleased. The Iran deal brought enormous benefits to the mullahs in Tehran, allowing them freedom of action now and nuclear weapons later, for which they received huge amounts of money. It could not be ended quickly enough. 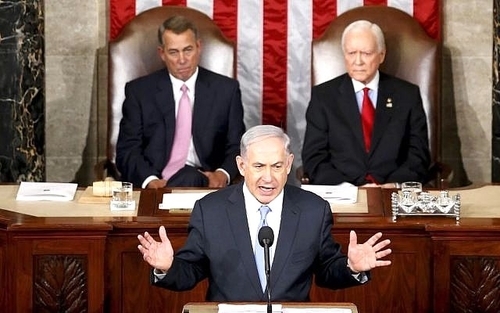 Question: Benjamin Netanyahu, a most outspoken opponent of the nuclear deal, said in his 2015 speech to Congress that "Iran's regime is not merely a Jewish problem, any more than the Nazi regime was merely a Jewish problem ... Iran's regime poses a grave threat, not only to Israel, but also the peace of the entire world." Was he right? Netanyahu speaking to a joint session of the U.S. Congress on Mar. 3, 2015. Answer: Very right. The Iranians are currently engaged in warfare in Iraq, Syria, Lebanon, and Syria, plus they threaten Saudi Arabia and other Persian Gulf states. Beyond that, the threat of a nuclear weapon setting off an electromagnetic pulse in the United States and other Western countries would cause a catastrophic loss of life. Question: Many European leaders have stated that the European Union will continue to maintain the JCPOA; realistically, can the deal be kept alive when the U.S. government restarts economic sanctions on Iran? Question: With an Iranian economy already on the ropes, how deeply do you think that the American decision of getting out of the deal will affect the country? Answer: The Iranian leadership have built a "resistance economy" that can withstand sanctions, so the country will manage the deprivations. Whether the Iranian people will accept increased poverty, however, is another matter. I expect it will be increasingly dissatisfied, leading to an eventual explosion. Headline in "The Guardian" one day after Trump's decision to pull out of the JCPOA. Question: In an interview with L'Informale in November you said "I wish Washington were more fundamentally hostile towards the Islamic Republic of Iran to the point of seeking to change the regime, but that has never been the case in the almost forty years of Khomeinist government". The appointments of Mike Pompeo as Secretary of State and particularly of John Bolton as National Security Adviser, plus pulling out of the Iran deal, indicate a more resolute approach towards Iran. Might you get your wish soon? Answer: I doubt it. Note what Trump said about Iran's leaders after his withdrawing from the JCPOA: "they are going to want to make a new and lasting deal, one that benefits all of Iran and the Iranian people. When they do, I am ready, willing, and able [to negotiate]." That does not suggest an intent to bring about regime change. Question: Do you see the recent direct confrontation between Israel and Iran as a possible prelude to something wider? Answer: Yes. While recent rounds appear to have been a near-total failure for the Iranians, they have more effective ways of striking Israel. They can have proxies attack Israel from Gaza, Syria, and (especially) Lebanon. Or they can deploy jihadi violence against Jews, as in Buenos Aires or Burgas. 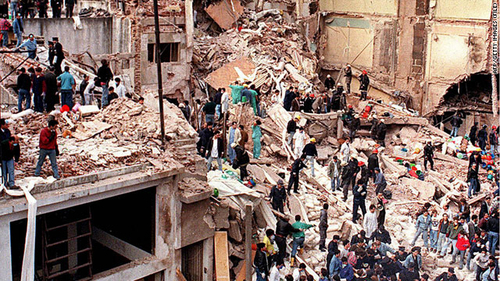 The aftermath of Iran's bombing of the AMIA building in Buenos Aires in July 1994, killing 85. Question: So far, Putin has not interfered with Israel's military activities against Iran in Syria but, even if Russia and Iran do not share geopolitical aims, they are allies. Is it not inevitable that Putin will make a choice against Israeli interests? Answer: No, that is not inevitable. First, Putin has consistently sought good relations with Israel. Second, he does not want the Iranians to dominate Syria, so the Israelis smacking them down serves his interests. Question: You have been skeptical of Donald Trump; what is your assessment of his bold decisions in the Middle East such as moving the embassy to Jerusalem, signing the Taylor Force Act, holding back on payments to UNRWA, and exiting the Iran deal? Answer: Trump's lack of political philosophy and his general unpredictability made me fear his making major mistakes in the Middle East. So far, I have been very pleasantly surprised. But he could change views in a New York minute, so I remain braced for future trouble.